Most Americans aspire to achieve the American Dream. But, where in the nation is the American Dream being realized to the greatest degree? The most recent data available (August 2012) from Xavier University’s Center For The Study of The American Dream suggests Americans living in the Southwest Region of the United States are achieving more of the American Dream than the balance of the Nation. The team at Xavier University conducts a monthly national survey to assess the degree to which the American Dream is being realized. The survey looks at 35 dimensions that are statistically clustered into 5 sub-indices. The sub-indices collectively are represented by a composite score called the American Dream Composite Index (abbreviated ADCI). The ADCI measures the degree to which the American Dream is being fully realized. In August 2012, the national ADCI score was 64.1%, which means as a nation we are 64.1% of the way to fully realizing the American Dream. The Burghard Group advocates that the ADCI is an excellent performance measure to evaluate the authenticity of Brand America’s promise and should be used by economic development professionals and elected officials as the “gold standard” metric to assess the ability of their communities to enable Americans to achieve the American Dream. In today’s economic development world the focus is on jobs and gross state product growth. But, the ADCI study clearly indicates these two measures are necessary but not sufficient to understand if Americans are making progress in achieving the American Dream. And, we believe because the opportunity to achieve the American Dream is what our nation promises its citizens, it should be the measure by which we should ultimately determine success or failure. Today, the ADCI is available on a national and multi-state regional basis. Looking forward, the Xavier University Team is looking at ways to collect sufficient data to generate ADCI scores at the state and major MSA level. When these data are available, it will be possible to compare states and cities on the degree to which the American Dream is being realized. At The Burghard Group, we believe this will become an important differentiator in the final choice of selecting a site for capital investment. CEOs will prefer to locate operations in communities where their employees have the highest probability of realizing the American Dream. The challenge for economic development professionals and elected officials will be to create strategies that neutralize their community’s barriers to achieving the American Dream and build on its competitive strengths. So, how well is the American Dream being realized in your location? First, it is important to know how the Xavier University Team defines the Regions so you can identify the most relevant score for your community. Now, let’s take a look at the August 2012 data. Nationally, we are 64.1% of the way to achieving the American Dream. But, Americans in the SW and SE Regions are doing much better in achieving the American Dream. If you were a CEO looking to make a capital investment, (assuming no other geographic constraint on the project) it would make sense to preferentially look at sites in states that are part of the SW and SE Regions. Of all the Regions, the Americans living in the SW Region are the furthest along in achieving the American Dream. But what are the enablers of that success? The scores by sub-indices provide insight. 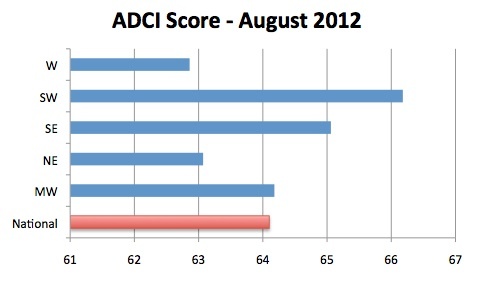 From these data you can see the SW Region exceeds the Regional average ADCI score on each of the 5 sub-indices. This suggests the SW Region has a broadly sustainable competitive advantage in enabling realization of the American Dream. In contrast, the SE Region is falling short of Regional average in 2 of the sub-indices (Societal and Diversity). For perspective, the societal index measures the extent to which the government, businesses, and people are fair and trustworthy. The diversity index measures the attitudes toward the assimilation of differences in one’s community. A description of all sub-indices can be found HERE. Each of these sub-indices can be explored even further by analyzing data on the 35 dimensions. This exploration would help pinpoint the highest priority areas for the SE Region to focus on addressing in order to become more competitive with the SW Region. Then specific strategies could be developed to guide choices on asset creation, infrastructure investment and public policy reform that would help enable Americans in the SE Region to realize the American Dream to a greater degree. Sub-index data is available on a subscription basis from Xavier University. The above walk-through is intended to illustrate how to use the ADCI data in economic development. Even though the industry is not organized in the way the data is currently reported, does not mean that the ADCI score is not helpful to guide the creation of local strategic plans for economic development. You would simply need to assume your community score and the Regional score are directionally correlated. In plain English, you’d assume the deficiencies or strengths of the Region are more or less reflective of the deficiencies and strengths of your community. Hopefully the Xavier University Team will be successful and be able to provide both state and major MSA level to help you fine-tune your analysis. But for now, the Regional data is what we have to work with. What if you focus on closing a performance gap identified by the Regional ADCI data and later find out it isn’t a gap for your community? The worst case scenario is you will have invested in strengthening the ability of citizens in your community to achieve the American Dream, and either moved a point of competitive parity in the right direction or further developed an existing strength. From a management perspective, that is an easy downside risk to take. In future blog posts, I will illustrate how to move from gap analysis to creating a strategic plan that will enable your community, state or Region to close the performance gap and improve the degree to which your citizens more fully realize the American Dream. I am really interested in your thoughts and questions. Both will help guide the direction of the discussion on how to use the ADCI in economic development. Please leave a comment. Ed, I think the government is happy to maintain the American dream as a moving target. Since the government will not work to resolve what needs to be done not wanting to jeopardize their own paid for positions I have to believe the American dream has become as idealized and as unobtainable for most Americans as Walt Disney’s idealized presentation of Main Street. Yes it is comfortable in sunny southern California and Greenwich, CT. More talent for my industry east of the Rockies obviously.